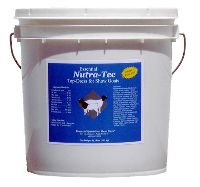 A pelleted top-dress product designed to increase the rack size and provide muscle definition and bloom to your show goat. High levels of Omega 3 Fatty Acids Contains Albion® Chelated Minerals Advanced Electrolyte System for increased muscle size. High milk content for increased bloom. Brewers yeast for enhanced digestion and a natural source of vitamins and minerals.